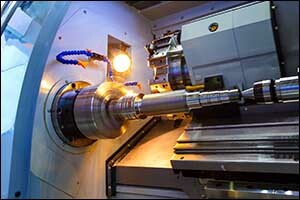 Many companies outsource their CNC machining to a machine shop in Massachusetts that can provide them with top quality services from precision machining specialists. The overhead cost to purchase CNC machinery for the purpose of machining precision components can be quite costly; however, it is also quite difficult to hire and maintain staff who have the training, experience, and knowledge to effectively run Massachusetts precision machining. AMI Machining believes in combining state-of-the-art equipment with the industry’s best practices to provide our customers with on-time service and quality products. We offer a wide variety of services that include production, turning, milling, and assembly. Located in Southeastern Massachusetts, our team of precision machining specialists fills orders for customers all across the country due to our dedication to quality assurance. CNC stands for computer numerical control, which is a program that allows software to manage the movements of various manufacturing tools and machinery. Some of those tools include grinders, lathes, and routers. The process of CNC machining allows technicians to perform precision cutting tasks that are reliable, repeatable, and consistently perfect every single time. CNC machining can save a company time and money, allowing a full set of instructions to be performed one after the other without any manual human intervention in a top quality machine shop in Massachusetts. The work that is done with a CNC process for machining precision components is controlled by a software program. This program, which is entered in by the technician through the use of a keyboard, is a strategic set of commands that are used to prompt the machine to perform a specific action or series of actions. This program can be saved and used by the technician again and again, as needed. The actions can also be edited if the needs for manufacturing by the client change in any way. This programming controls everything from the feed rate to the speed of the machine, coordinating each movement that is made to create the desired result. It can even be programmed to move the tool from one location to another, allowing it to perform multiple functions in consecutive order or the middle of the program. When you contact AMI Machining to discuss your needs with our precision machining specialists, you will likely hear the term CAD being used. If you are unfamiliar with this term, CAD stands for computer-aided design, which is the first step required to produce a CNC program to create the specific parts, products, or components for our customers. One of the technicians at our machine shop in Massachusetts will then use CAM software, which stands for computer-aided manufacturing, to help design all of the necessary steps that the machines will use to manufacture the requested item. This process can involve the use of several tools, as well as different machines, to complete the order. Compared to other types of manufacturing, CNC machining precision components provides the technician with a high level of consistency that is just not available through the use of manual manufacturing operations. There are many advantages associated with using Massachusetts precision machining for production. Our team of precision machining specialists has the technical expertise and manufacturing capacity to assist our customers with just about any application, regardless of how large or small, custom or standard, complex or simple. We can work directly with your engineers to develop a prototype from the early design phase to ensure that you are able to meet all of your machining and production deadlines and provide quality management for best results. Our Southeastern Massachusetts facility has a wide variety of high-value, advanced equipment, including CNC machining for machining precision components, for both the long and short-run part milling. Our team of engineers and technicians work with CNC turning lathe centers, which are designed to support large diameter turning at close tolerances. Our custom production team at AMI Machining is fully committed to lean manufacturing, and we are preparing to become even more aggressive with it in the future to continue improving quality, service, and value for our customers. If you would like to learn more about our machine shop in Massachusetts or if you are interested in placing an order for machining precision components, give us a call at 508-947-1192. Located in Middleboro, Massachusetts, AMI Machining provides top quality services to customers throughout the New England region and all across the country. We are a US Veteran Owned Company, ITAR Registered, and ISO 9001 Certified to provide our customers with results designed to meet or exceed industry standards and expectations.